Rock Bar is a Florida beach bar located in Fort Lauderdale. Discover this great Florida beach bar. The Rock Bar is one of a string of restaurants/bars on the Ft. Lauderdale strip across the street from the beach. As you walk down the "strip", you will come across one Florida beach bar after another. It is hard to choose the one to visit. They are all enticing. 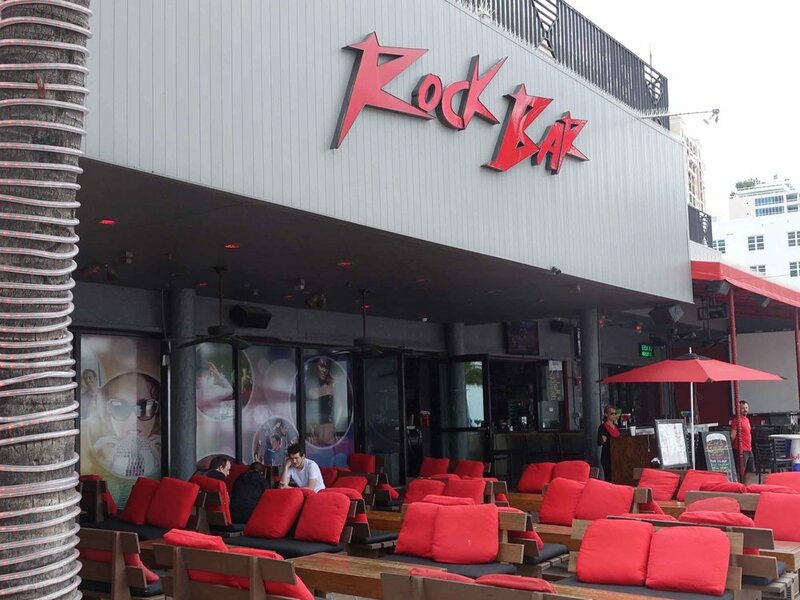 You will be enticed by The Rock Bar because they offer huge drinks and comfy looking red couches. It doesn't usually take much to get us into a bar. Red couches can do it. We think Rock Bar is a great place to people watch and enjoy a super sized beverage. And we do mean super sized. How about this? Happy hour is two for one all day every day. Rock Bar even offers a hookah menu. You can certainly spend the whole day at this Florida beach bar. Rock Bar's location is perfect. Sitting at a bar on Ft. Lauderdale Beach Boulevard, you will see some interesting sights. A fun way to spend an afternoon or evening is to sit at a Florida beach bar and watch the activity on the strip. Rock Bar fits the bill.When you get tired of watching the crowd on the street, step inside for some live music and dancing. This Florida beach bar sure is lively.